What a lovely little family!! Gorgeous - the little ones are adorable. Beautiful shot. Oh wow - amazing capture Rob!! This is fantastic! The details are amazing and the little. Ones are adorable! It's so much fun sharing these moments with my 365 Family. Thanks all for stopping in and commenting. Rob - this is an amazing shot! You have really perfected shooting these beautiful birds. I love everything about it. A FAV for me. Thanks for your kind comments. Certainly been a fine day for me; both the shot I got, AND for the one I didn't get! Walking down in our wood and almost stepped on a young skunk. No pics, but then, I didn't get sprayed either! Wow this geographic explorer material here. Incredible clarity & lighting on this Rob. Man you knocked it out the park! OMG this is gorgeous. 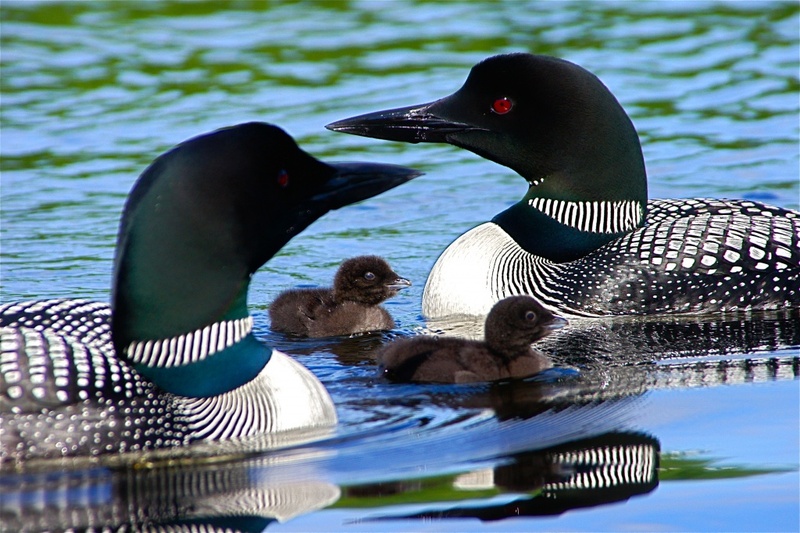 I have always wanted to get some loon shots with babies. Maybe you'll get some of the babies riding on their parent's back. Al and Myrna, Thanks so much for taking the time to view, and your kind comments. I'm hoping for a back shot or two. One was on the back as I approached but then slid into the water. Time will tell. Great find and capture! Lovely shot! Good job, Rob. FAV for me. fav this for sure. AMazing. love to see the new families!! Last year we had only one chick. Hoping that both survive to fledge. Stay tuned. Superb shot of this beautiful family. They look very proud and protective. Wonderful, and a great shot! I'd almost like to go out sometime in disguiise; different kyak, clothes, etc. and see how they'd react. I'm convinced that after more than a few seasons they recognize me and that's why they allow me to get so close. one of my favorite birds..........this ia a beautiful family shot! A fav! GreAt family capture! So many loons lose their chicks - it's a hard life but nice to see these one's doing well! Thanks for taking the time to view and comment! This is such an awesome shot, well done. Thanks for taking the time to view and comment. Glad you liked it. Wonderful. I was up north and heard loons but never had a chance to shoot them. A fav! A beautiful capture of this lovely looking family - fav!! Thanks for stopping in. I'd always thought of the "call of the loon" as a long distance phone call kind of thing. I'm realizing with this pair that they're often quite vocal even when only a few feet separates them. I'm glad I found this on PP and thought to myself... I know those loons! Well deserving of all the favs! the exposure here is magnificent and I bet it wasn't easy to do. . .they are just gorgeous. Congrats on the PP! Wow! Great pov, and nice close-up. The chicks are so cute! a fav! Thanks for your comments. Considering how things turned out, I'm glad I at least got a nice picture or two. Congratulations on making top 20 with this shot. Didn't know that. Thanks, B.! Les, Thanks for your note. You may know if you've read some of the other comments that , sadly, neither chick survived past about the first week. Great moment. Hadn't seen your project before but will watch it now. Linda and Jann, Thank you both for taking the time to view some of my work. It's nice to hear from you.